Female human aristocrat 1/bard 3: hp 27, AC 16. Annah Taskerhill, if any, is the leader of this bunch. Shrewd and charming, calculating and adorable – to the core, Annah is both charismatic and lovely to behold. 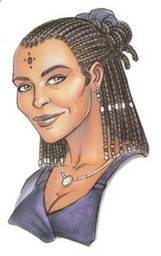 Daughter to Lord Ankhin Taskerhill, the wealthiest man in Sasserine. The Lord Taskerhill owns most of the mines in the region and augments his vast wealth with a modest trade in obsidian furniture, to boot. His daughter sits here now in the front row, clapping madly whenever the duo of Tenacious Tendencies pauses for breath in their storytelling.